Election officials in most Kansas counties are beginning to review some 9,000 provisional ballots Monday as part of a statewide effort to arrive at final official vote totals in the tight Republican primary for governor. Secretary of State Kris Kobach led Gov. Jeff Colyer by 110 votes out of 313,000-plus cast after late mail-in ballots from all 105 counties were added Friday to totals from advance voting and ballots cast at the polls Tuesday. The canvass was beginning early Monday in suburban Kansas City’s Johnson County, where a board it set to review 1,800 provisional ballots, given to voters at the polls when their eligibility is in question. Seventy-six counties start canvass meetings Monday, but some will meet later this week and next. Colyer’s team said they would have representatives at every canvass meeting to watch the process. TOPEKA, Kan. (AP) — County election officials across Kansas will begin deciding which provisional ballots from last week’s primary election will count toward the final official vote totals, with the possibility that they could create a new leader in the hotly contested Republican race for governor. Secretary of State Kris Kobach led Gov. 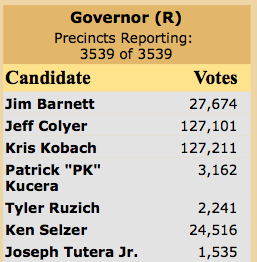 Jeff Colyer by a mere 110 votes out of more than 313,000 cast as of Friday evening . That was after late mail-in ballots were added to totals from absentee voting and ballots cast at the polls Tuesday. County officials will review nearly 9,000 provisional ballots, given to voters at the polls when their eligibility is in question. Most counties start their canvass meetings Monday, but some will meet later this week and next. The counties have until Aug. 20 to finish. With such a slim margin separating the candidates, the canvass will be closely watched. Colyer’s campaign on Friday announced plans to have representatives in all 105 counties when provisional ballots are reviewed. Attorney General Derek Schmidt already is anticipating the possibility of a lawsuit challenging the election results by Colyer or Kobach. He sent a letter to county election officials, reminding them to preserve “any paper files, notes, or electronic data related in any way” to the election. Kobach also flatly rejected Colyer’s criticisms of the secretary of state’s actions to date. 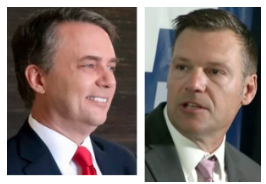 “As governor of Kansas, your unrestrained rhetoric has the potential to undermine the public’s confidence in the election process,” Kobach wrote. Kobach on Friday stepped aside from his duties as the state’s top elections official until the primary outcome is resolved, but Colyer argued that Kobach still has a conflict of interest because Kobach is handing his responsibilities to his top deputy, Assistant Secretary of State Eric Rucker . The secretary of state’s role in the actual counting of ballots is limited: His office provides guidance, compiles statewide vote tallies and provides general supervision. TOPEKA, Kan. (AP) — The counting of the last ballots in the tight and contentious Republican primary for Kansas governor will stretch out over the next week and still might not settle the race. Kansas Secretary of State Kris Kobach leads Gov. Jeff Colyer by 110 votes out of 313,000-plus cast after late mail-in ballots from all 105 counties were added Friday to totals from advance voting and ballots cast at the polls Tuesday. The state’s 105 counties still must review nearly 9,000 provisional ballots and determine how many of them were cast in the Republican primary — and how many will be counted. They have until Aug. 20 to finish that process and certify their local results. The secretary of state appoints an election commissioner in the state’s four most populous counties, Johnson, Sedgwick, Shawnee and Wyandotte, and the chief elections officers in the other 101 are elected clerks.